than the "Snake River near Irwin, ID"
which is 1.5 mi downstream. A forward-stepwise linear regression procedure was used to calibrate the observed flow record with a pool of potential predictor chronologies from Wyoming and Idaho. Chronologies lagged 1 year forward and backward were also tested as potential predictors to account for differences in timing between the tree growing season and the water year. The residual chronologies, with the low-order autocorrelation removed, were used. Two predictor chronologies were selected by the stepwise procedure for the reconstruction model for the Snake River near Irwin, ID. Validation statistics were computed using a leave-one-out (cross-validation) approach. Further details are provided in Wise (2010). Figure 1. 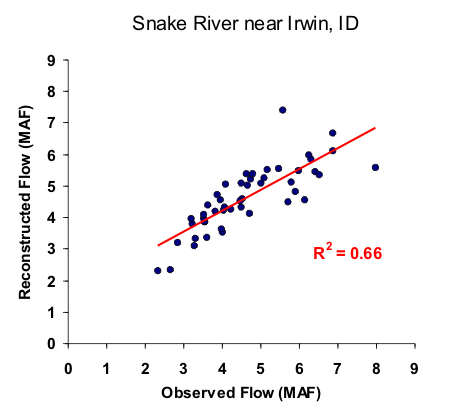 Scatter plot of observed and reconstructed Snake River annual flow, 1958-2005. Figure 2. Observed (black) and reconstructed (blue) annual Snake River annual flow, 1958-2005. The observed mean is illustrated by the dashed line.